For Many Chelsea Fans, it wouldn't be a bad idea to see their two Number 9 Alvaro Morata and Olivier Giroud play together up front in a match. In a pre-match interview earlier today, Antonio Conte hinted that he is considering playing with the two strikers up-front in order to accommodate both club-record singing. 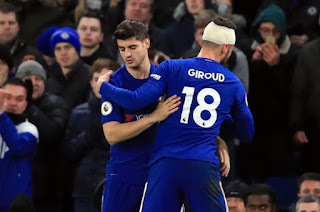 In Chelsea's last match, Alvaro Morata came in as a substitute for Giroud and the Spanish striker looked lively in the game. During an interview, Conte was asked if he is thinking about playing his two strikers together, He replied by saying: "I think that in the future yes, it could happen." "If we decide to play with the three midfielders. But during the game can happen, but now I think it's very soon to answer this question." "Don't forget we are playing with a system from last season and in the case [I play with two strikers] it means Hazard, Pedro and Willian are out." Asked about the importance of having this option, He said: "Yeah for sure, in this moment it's important to have all your players available." "To have two No.9s, Morata and Giroud, to have two options is very important for us. Don't forget for a lot of time we tried to play with Hazard as a No.9!" Chelsea will be facing Hull City on Friday in an FA Cup clash.